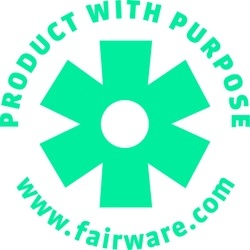 Fairware is a Founding B Corporation and offers a broad range of custom branded sustainable promotional merchandise. We're the one-stop-shop for custom merchandise for North America's leading sustainable brands, colleges and non-profits. Our clients include Patagonia, Aveda, Unicef USA, Ben & Jerry's, University of BC, University of Maryland and others. We have years of experience providing merchandise to animate your on campus zero-waste, energy and water conservation and sustainability campaigns. We help manage the burden of buying promotional merchandise and work hard to identify cost savings and high impact products for your campaigns so you can focus on your marketing and brand priorities. We dream, design, and fabricate your visions – whether manufacturing your waste materials into up-cycled products or building custom products with our trusted supplier base. We are a leading source of expertise in the sustainable sourcing of promotional merchandise and helping students learn.